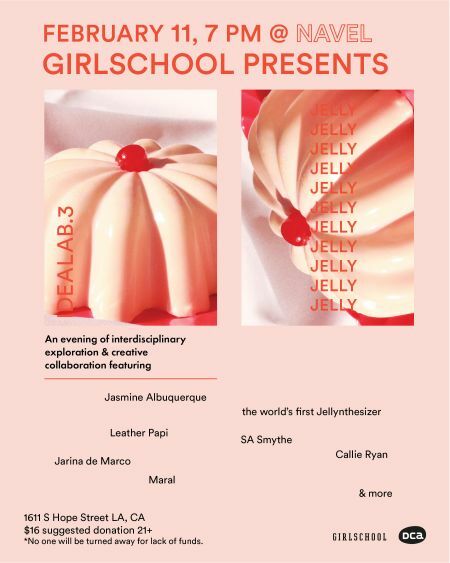 WHAT: GIRLSCHOOL presents IDEALAB.3: JELLY, an interdisciplinary exploration of the strange human experience of embodiment. Idealab is Girlschool’s experimental, performance-led event series. Each Idealab invites a variety of voices to investigate a theme through creative experimentation and collaboration in an intimate environment. JELLY includes music, movement, critical discourse, performance art, a Rococo Jell-O installation imagined by Jarina de Marco, and the world’s first interactive Jellynthesizer, which explores the tender internal systems of the body through the external avatar of Jell-O. WHO: Featuring contributions from Jarina De Marco (creative director), Leather Papi(performance artist), Maral (composer), Callie Ryan (sound artist), Jasmine Albuquerque (choreographer), SA Smythe (poet, scholar), Randa Jarrar (author), Kerstin Hovland (visual design), and special guest. **Since it came to be in 2016, Girlschool has held three annual sold-out women-led three-day music and ideas festivals in Los Angeles, and partners with TOMS to bring an annual capsule festival to SXSW. In addition, Girlschool works with different partners throughout the year to present creative, interdisciplinary women-forward experiences on the forefront of culture through the Idealab series, plus bespoke collaborations. TICKETS: $16 Suggested Donation, which includes cocktails. Tickets available HERE. No one will be turned away for lack of funds. 18+. For more information about Girlschool, please visit www.girlschoolla.com.